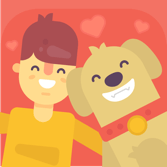 This app is used to take the best selfie and videos with your pet. The radom background sound attracts pets to watch the screen. • Option to select background sounds and user can unlock new sounds by collecting new coins. • Record new sounds to attract pets. • Store option where listing of sounds, coins and other option are available. • In app purchase to unlock new background tunes and to purchase coins. • User can get more coins by watching videos options, on every watch some coins will added in your account coins. • On setting option user can restore your purchase, update pet’s profile, connect with admin by giving feedback via email.